Cottage cheese with cinnamon "sugar"
Smoked salmon with whole wheat toast and "creamed cheese"
Low-carb cooking has never been this easy-or delicious! 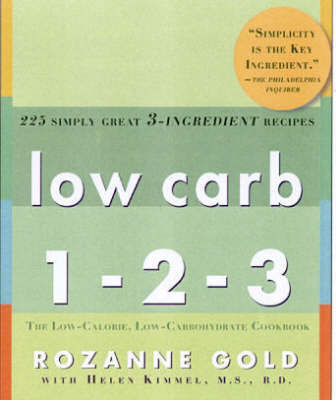 Now 1-2-3 cooking goes low-carb, and the results are simply fabulous! Here readers learn how to create dishes that are not only low-carb but low in calories and saturated fat-from Pan-Seared Tuna Niçoise, Baked Eggs Splendido, and Wasabi-Stuffed Shrimp to Fresh Cherry Compote with Chocolate Drizzle-each using only three ingredients! Perfect for today's busy lifestyles, these recipes make it easy for anyone to eat more healthfully every day.